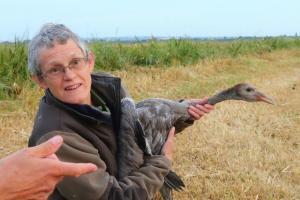 Alison with 8 wk old crane - nicknamed 'Javi'. Wonderful to catch and colour ring one of the new generation of cranes on the Somerset Levels and Moors this morning. 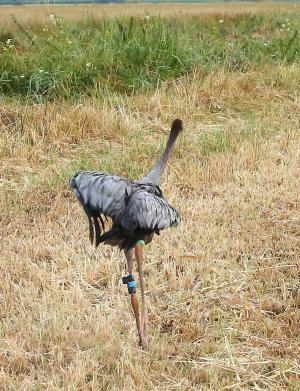 Javi is the offspring of the hand-reared cranes Jasper (the male) and Viridor (female) released through the Crane Project between 2010 and 2014. This bird is the result of this pairs first breeding attempt - although Jasper did make an attempt last year with and older female Regina. This year, with his younger partner - he seems to have found success. The chick is approximately 57 days old and should be flying within a couple of weeks. The catch team of 3 (Alison, Alick and Damon) lay in wait for a couple of hours, hidden in vegetation and behind hay bales, from before first light. The chick was caught as it headed out from it's night time roost to hay meadows to feed on grasshoppers, crickets, snails, and other tasty treats. With the catch team keeping their heads down - a watcher with a telescope at a distant vantage point (Harry) provided information on the birds' movements and location, through ear-pieces hooked up to two-way radios. 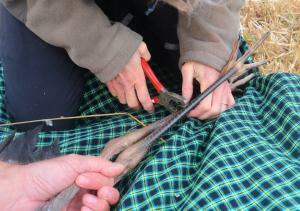 Attaching the BTO metal ring - a highly specialist job. Colour ringing these second generation birds is the only way the project will be able to assess the survival and reproductive success of the offspring, and be able to determine if the population is growing through recruitment or through immigration - or a mixture of both. Walking into cover, soon to be reunited with its parents. 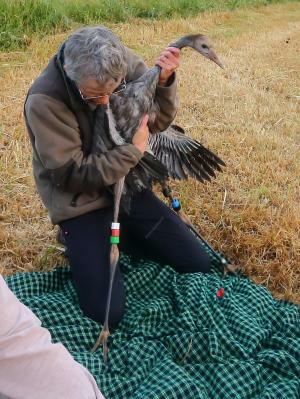 It was also a bonus morning - as we discovered another large crane chick being reared by its parents close by. We had seen neither sight nor sound of this particular pair for the last 3 weeks and were fearing the worst... but this morning they appeared in a neighbouring field! They also nearly blew our cover, but luckily we were well hidden enough. A huge thankyou Alick, for the wonderful photos too. Damon’s role is to act as the hub of the project - making sure everyone involved knows what is going on and that it is all running smoothly. He is also responsible for project community awareness work in Somerset, construction of the release enclosure, and running the post release monitoring work in Somerset. Damon works alongside the RSPB reserve teams in Somerset.